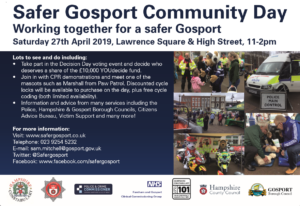 On the 27 April, the Safer Gosport Community Day is taking place in Gosport Town Centre around Lawrence Square, High Street and Nat Gonella Square. There will be lots on offer for the whole family with free cycle coding, glitter tattoos and an appearance from Paw Patrol’s Marshall/Chase for our younger residents. Local emergency services including GAFIRS, HM Coastguard and Wessex SERV will be displaying their vehicles with Community First Responders demonstrating CPR techniques. 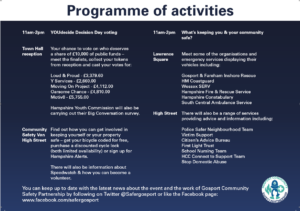 Lots of information and advice will be available from a range of organisations including Hampshire Connect to Support Service, Citizen’s Advice Bureau, School Nursing Team and many more! 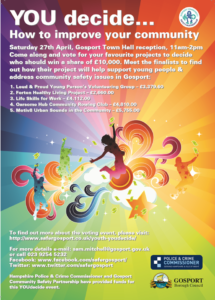 There will also be a special opportunity to take part in the YOUdecide voting event, which will be held in Gosport Town Hall. The leaflet lists the five finalists, including our very own Loud and Proud, and the amount they are applying for. Each of the projects will have an information stand located within the Town Hall reception, for residents to ask questions and find out more about what the funds will pay for.